On site registration opens at 8:00am. Race starts at 9:00am. Join us on Saturday, May 11, for the Sri Chinmoy 5K, Half-Marathon, Relay and Kids Race, featuring a scenic, flat and fast 5K loop around Flushing Meadows Park. Accurately measured USATF certified course. 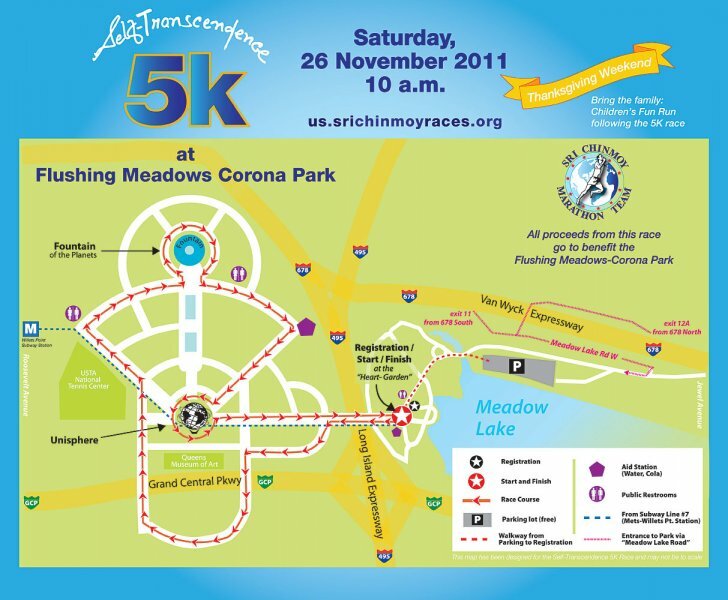 Sponsored by the Sri Chinmoy Marathon Team in cooperation with the NYC Parks Department. AMENITIES: Free Parking, bag check, aid stations every mile, free T-shirt, medals for all finishers, and our famous post-race pancake breakfast! THE COURSE: A flat and fast USATF certified loop starting at the north end of Meadow Lake, passing the iconic World's Fair Unisphere, Fountain of the Planets, Queens Zoo and Queens Museum of Art. 5K = 1 loop, Half-Marathon = one 5K loop + three 5.37K loops. HALF-MARATHON RELAY RULES: Each relay team must have 2 to 4 team members. Each team member must complete at least one lap. 4 laps = Half-Marathon. First lap =5K, laps 2, 3, 4 = 5.37K each. If the relay team has less than 4 members, at least one team member must complete more than one lap. It's up to the team's strategy which team member(s) complete the extra lap(s), and in which order the laps are completed. There are 3 relay team categories: All male, all female, or mixed (at least one male and one female member). The team's category is determined by the gender makeup of the team after online race registration closes. Each relay team will be given a baton. The baton must be carried on all laps, and passed from one teammate to the next inside the designated relay transition zone (near the finish line) All relay team members must register online through our RedPodium registration page The first team member to register must "create" a relay team as they register. Additional relay team members must register and pay for their entries separately, signing up for the relay team as they register. Deadline for all team members to register is Monday, May 6 (online registration close). If for any reason your team mates do not show up on race-day, your relay entry can be converted to the 5K race at no charge, however this must be done on race day before 8:30AM AWARDS: Men’s and Women’s awards categories: 5K and Half-Marathon: Under 50: Top 7 50-59: Top 3 60-69: Top 2 70 & over: First Place Half-Marathon Relay: First place each for top men's team, women's team, and mixed team (at least 1 male and 1 female member) Awards ceremonies: 5K: 9:50 a.m. Half-Marathon & Relay: 11:15 a.m. T-SHIRTS: Free race T-Shirts guaranteed for all participants registered by Friday, April 26 For participants registered after April 26, any extra T-Shirts will be available after the race, distributed on a first-come first-serve basis T-Shirt sizes are Unisex: X-Small, Small, Medium, Large, X-Large, 2XL POST-RACE PANCAKE BREAKFAST! Hot pancakes are even more enjoyable when they’re earned, and we’re cooking them up fresh for everyone on race day! And yes, friends and family are welcome to dig in, too. TIME LIMITS: 5K: 1 hour (20 minute/mile pace) Half-Marathon: 3 hours 15 min (15 minute/mile pace) AGE RESTRICTIONS: 5K & Half-Marathon Relay: Open to ages 13 & up Half-Marathon: Open to ages 16 & up KIDS RACE: There will be a kids race at 8:45 a.m. for children under 13. 100 meter and 400 meter distances - depending on the child’s age. Registration - $2 - is on race day only, starting at 8:00 a.m. Each child will receive a small prize. REGISTRATION AND FEES: We strongly recommend pre-registering for this event, race-day registration may not be available Register Online through RedPodium or Active. Processing fee applies (RedPodium has lower fee). Register by mail: Download entry form. Entry must be postmarked no later than Friday, April 26 to be accepted. 5K: Early: $20, Late: $25, Race-Day: (IF available) $30 Half-Marathon: Early: $35, Late: $40, Race-Day: (IF available) $45 Half-Marathon Relay: Early: $20, Late: $25 per team member. No Race-Day entry for relay. Early registration: Through Friday, April 26 (By mail, or online, T-shirt guaranteed) Late registration: Through Monday, May 6 (Online only, T-shirt not guaranteed) Race-day registration (IF available): 7:45-8:30 AM. Cash, check, money order ONLY. (Sorry, no credit cards). Please check our website on May 7 to see if race day registration will be offered for the 5K and Half-Marathon. Race-day registration will NOT be available for the Half-Marathon Relay. Entries are non-refundable and cannot be transferred to another person. RACE NUMBER PICKUP: Number pickup will be on race day only, between 7:45-8:30 AM DIRECTIONS: You can drive to the race (free parking right next to race-day central), or take the Subway (7 train to Mets-Willets point) Please familiarize yourself with the map and directions on our race website before race day, Flushing Meadows Park is a VERY BIG park (larger than Central Park), we don’t want you to get lost! RESULTS: Will be posted on our race webpage within 24 hours. ABOUT US: From race directors to course monitors, all Sri Chinmoy Marathon Team races are staffed by its own volunteers since the Team’s inauguration in 1977 by its founder and fitness advocate, Sri Chinmoy. Today, the SCMT organizes over 500 races a year in 20 countries across 5 continents, ranging from short kids fun-runs, to marathons to the world’s longest certified road race – the annual Self-Transcendence 3100 mile race (yes, 3,100 miles, it’s not a typo). We love running and putting on races – we hope you enjoy the friendly atmosphere we provide, free of commercial sponsors.